An international multi-disciplinary research team from Brown University, the Heidelberg Institute for Theoretical Studies, and Yale University has reconstructed the largest evolutionary tree (phylogeny) for plants and learned that major groups of plants tinker with their design and performance before rapidly spinning off new species. The finding upends long-held thinking that plants’ speciation rates are tied to the first development of a new physical trait or mechanism. The U.S. National Science Foundation (NSF iPlant initiative) and the German Science Foundation (DFG) funded the research. Providence, RI [Brown University]/Heidelberg, Germany [Heidelberg Institute for Theoretical Studies]/New Haven, CT [Yale University] — Evolution has been successful for billions of years and produced a vast amount of successful new species, but we still do not understand the underlying mechanisms. Researchers from the U.S. and Germany have recently unraveled new parts of this process. They found that plants initially tinker with their configuration and performance prior to coming up with new, improved versions of themselves. The issue at hand is when a grouping of plants with the same ancestor, called a clade, begins to spin off new species. Biologists laboring over assembling the tree of life have long assumed that rapid speciation occurred when a clade first developed a new physical trait or mechanism and had begun its own genetic branch. But the team, led by Brown post-doctoral researcher Stephen Smith, who is also affiliated to the Heidelberg Institute for Theoretical Studies (HITS), discovered that major lineages of flowering plants did not begin to rapidly spawn new species until they had reached a point of development at which speciation success and rate would be maximized. The results are published in the American Journal of Botany (2011; 98 (3): 404 DOI: 10.3732/ajb.1000481). Research in this area is only possible with computational methods. “This is a nice example of how computer science and cyberinfrastructure initiatives can help to extend the limits of biological explorations” says Alexandros Stamatakis, group leader of the scientific computing group at HITS (Heidelberg). 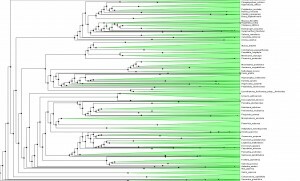 To tease out the latent speciation rate, Smith and co-workers computed the largest plant phylogeny (evolutionary tree) to date, involving 55,473 species of angiosperms (flowering plants), the genealogical line that represents roughly 90 percent of all plants worldwide. Reconstructing a tree of this size is also a technical milestone and a starting point for many other studies. The researchers looked at the genetic profiles for six major angiosperm clades, including grasses (Poaceae), orchids (Orchidaceae), sunflowers (Asteraceae), beans (Fabaceae), eudicots (Eudicotyledoneae) and monicots (Monocottyledoneae). Together, these branches make up 99 percent of flowering plants on Earth. The common ancestor for the branches is Mesangiospermae, a clade that emerged more than 125 million years ago. Yet with Mesangiospermae and the clades that spun off it, the researchers were surprised to learn that the boom in speciation did not occur around the ancestral root; instead, the diversification came about some time later, although a precise time remains elusive. Shifts in diversification aren`t often directly associated with the origin of the familiar group (orchids, sunflowers, etc.). There are many more shifts than one might imagine. The diversity patterns may be explained not just by a few major shifts, associated with the major groups, like flowering plants. Instead, the diversity of groups more likely reflects a composite of many individual, smaller bursts within clades. It wouldn´t be possible to see this very well in the context of small phylogenies. Smith believes some triggers for the speciation explosion could have been internal, such as building a better flower or learning how to grow faster and thus outcompete other plants. Or, the winning edge could have come from the arrival of pollinating insects or changes in climate. The team plans to further investigate these questions. “Taken at face value, our analyses suggest that many bursts in speciation, spread quite evenly and hierarchically across the entire tree, are responsible for the evident success of the flowering plants,” explains Jeremy Beaulieu (Yale). The U.S. National Science Foundation (NSF iPlant initiative) and the German Science Foundation (DFG) funded the research. The computations to assemble the phylogeny were performed at Yale’s High Performance Computing Center and at the Texas Advanced Computing Center. 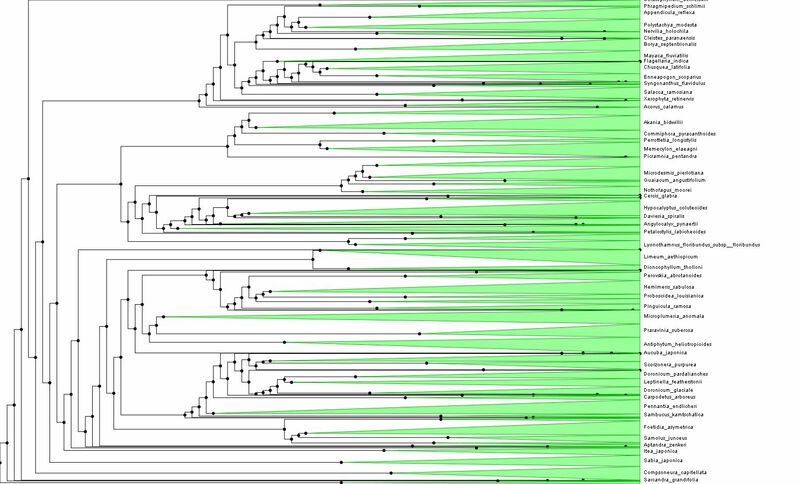 The tree can be browsed online at: http://portnoy.iplantcollaborative.org (select BigPlantTree) thanks to resources provided by the NSF iPlantCollaborative and the efforts by Karen Cranston at the National Evolutionary Synthesis Center.